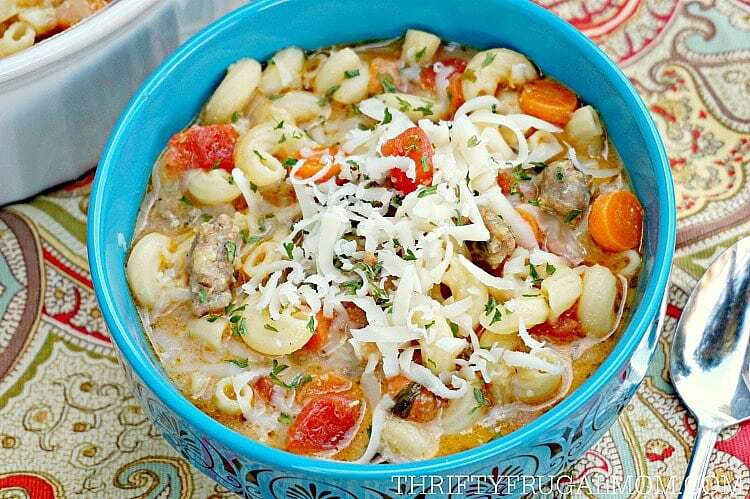 This Creamy Italian Sausage and Pasta Soup is loaded with Italian sausage, macaroni, basil, tomatoes, cheese and more. So hearty and delicious! This post is part of a social shopper marketing insight campaign with Pollinate Media Group® & Lactalis American Group but all my opinions are my own. I’ve always said that Spring was, hands down, my favorite season. But I have to be honest, the last several years, Fall is slowing pulling me in. After the intense summer heat, the cooler weather that Fall brings is just so welcome and refreshing! And there’s something so inviting about cozy sweaters, beautiful autumn leaves, favorite fall desserts like Pumpkin Crunch Cake and Easy Apple Dumpling Dessert, sipping on Warm Vanilla Custard Drink and eating comforting soups. Especially soups! We have lots of favorite soup recipes around here and I’m always excited to start putting soup back on the menu when cool weather arrives. We, of course, have our favorite soup recipes, but I’m also continually trying new soups and adding them to our repertoire, too. Occasionally, I even have fun experimenting and coming up with my own new soup recipe! 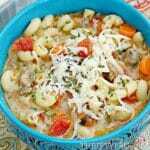 And that’s exactly how this Creamy Italian Sausage and Pasta Soup recipe came about. The inspiration for it started when I made a soup recipe with similar flavors, but without the Italian sausage. We were in the middle of eating it when I had this “aha” moment of how good something like that would be with sausage. I mentioned it to my husband and he totally agreed that sausage would be the perfect addition for those flavors. So when I was at Giant Food getting groceries last week, I finally grabbed the ingredients I needed and decided to get this Italian sausage pasta soup recipe out of my head and onto the blog! 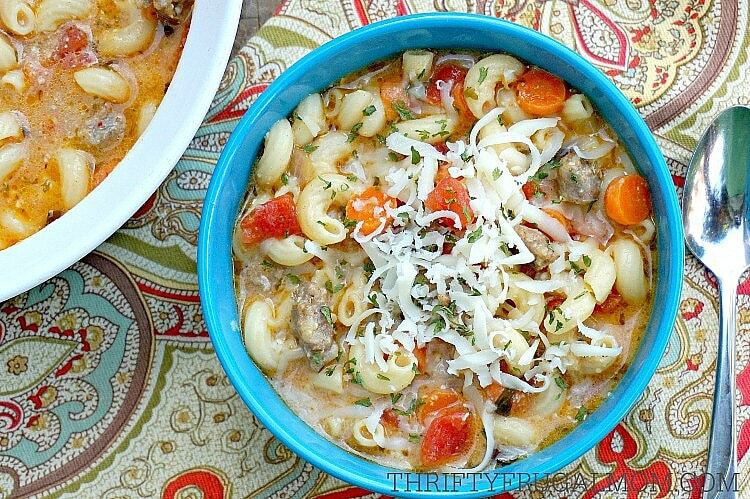 When I thought about this Creamy Italian Sausage and Pasta Soup, there were several things that I knew I wanted it to be. For starters, my goal was to make this soup hearty enough to provide a filling meal for us, even on days when everyone was super hungry. Plus, while my husband will eat thinner soups and not complain, he really prefers a thicker, more filling soup. So it was important to me that it would be a recipe that he would thoroughly approve of too! One way that I often make a recipe more hearty and filling is by adding potatoes, beans or pasta, along with meat. Since this soup was going to have an Italian flair, I went with Italy’s #1 choice of pasta: Barilla! The Barilla brand of pasta makes it easy to get al dente perfection every time, which I love. 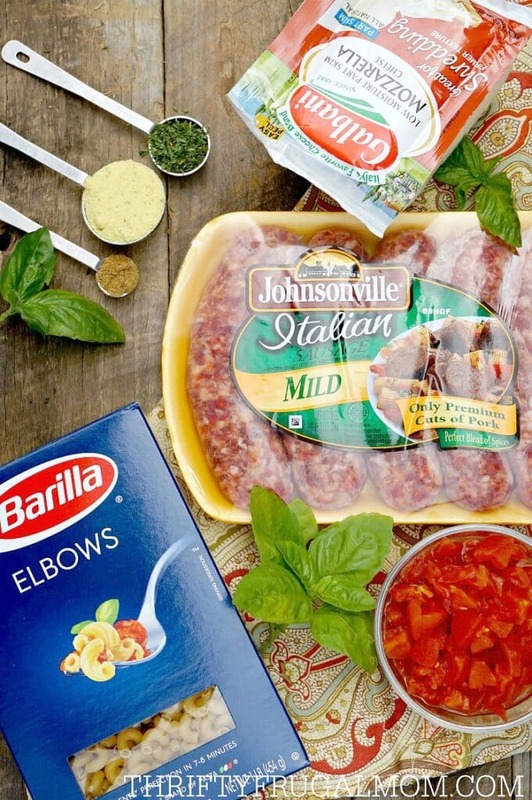 And continuing on with the Italian theme, I also included Johnsonville Italian Sausage. I like how flavorful these sausages are, with all their delicious spices and seasonings, and I knew that it would compliment the pasta perfectly. It was also important to me that this Creamy Italian Sausage and Pasta Soup was full of flavor and one of those comfort food sort of dishes. So I used chicken broth for the soup base and added lots of spices, and then, of course, some milk and cheese too. Because what’s more comforting in a soup that creaminess and cheese? And then right before I served it I shredded some Galbani mozzarella cheese on top for even more ooey, gooey cheesy goodness! SO yummy! Give it a try yourself! I think you’ll agree that it’s the perfect sausage and pasta soup! Cook pasta in 2 qts. water and 1 tsp. salt until al dente. Drain and set aside. Melt butter in soup pot; add onions, carrots, and garlic cloves and cook for about 5 minutes or until vegetables are slightly soft, stirring frequently. Sprinkle in flour and cook, while stirring, for 3 minutes. Gradually add chicken broth, followed by tomatoes, sugar, and all the herbs and seasonings. Reduce heat and gently simmer for about 20 minutes or until vegetables are tender. Stir in Parmesan cheese until smooth, then add the milk, cooked sausage and cooked pasta. Stir well and heat through. Garnish individual servings with freshly grated mozzarella cheese. If you don't have fresh basil, you can substitute dried basil. The rule of thumb seems to be that when using dried herbs instead of fresh, you use 1/3 the amount. Which would mean you'd need to add about 1 ½ tbsp. of dried basil. That seems like kind of a lot though, so you could always start with less and then add more to taste. These recipe looks so tasty and so comforting. It has all the items in it that my kids like to eat too. I am going to give this recipe a try, thank you so much for the post. I think you'll love it, Addi! This soup sounds amazing!!! i am trying it ASAP! Do you think or have you tried freezing it? i love making a big stock pot of soup if i can so i can freeze some but sometimes the pasta gets funky and mushy. Lindsey, I think you'll enjoy it a lot! It's so hearty and just full of flavor. I have not tried freezing it. Like you, I love making a big pot of soup too! But with our family being as big as it is, I typically can get by with just keeping it in the fridge and eating the leftovers later on in the week. I know what you mean about pasta sometimes getting a funky texture after it's frozen. If you want to freeze it, you could try just cooking the pasta until it's just so softened. Or you could also just make the soup and not add the pasta and milk until you take out half of the soup- then you'd freeze half of it without the past and milk (since milk can sometimes get a bit strange when frozen too) and add those 2 things to the frozen soup after it's thawed. If you try freezing it as is, I'd love to know how it turns out for you! We loved the soup it was amazing! even better left over! I have frozen goulash without the pasta, then cook the pasta and stir in when reheating, if more liquid is needed I add a can of v8 juice. With this soup I would do the same but add more chicken broth if needed. Hope this helped. That's such a great idea, Cynthia! Thanks for sharing. How creamy is it? Could part of the milk be replaced with heavy cream to make it even creamier if not that creamy to begin with? Amanda, I would say that it is lightly creamy. You most definitely could replace the milk with heavy cream to make it more creamy! I just pretty much always use milk because it's less expensive....but the cream would make it even more delicious I'm sure. Wow. I made this for dinner this evening and believe it has become one of my favorite soups. I didn't have any cheese (we live in Africa), but I had Parmesan stuffed tortellini (thanks to a random item on a bargain shelf in the mall). That was a fun pasta to use in lieu of the macaroni. And it added the cheese we didn't have. Delish! So happy that you loved it, Sara! And using the Parmesan stuffed tortellini was a great idea. :) I'm sure you've had to get used to being creative, but that substitution is one that I'd actually enjoy trying! This soup is perfect! 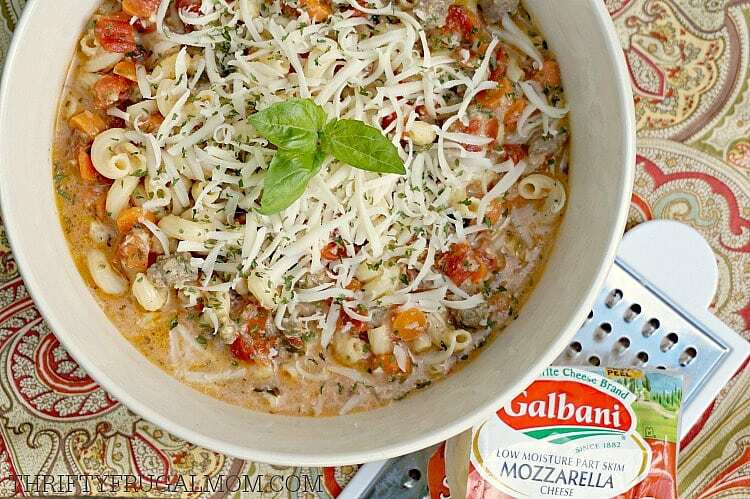 I love soups for the fall and winter and anything with pasta is always a hit in my house! Yum! This one will be made again and again! So glad you all love it, Crystal! Genius! I don't know why I never think of making a soup with sausage, it is delicious and adds so much more flavor! Next time, I'm going to try your homemade stock. Soups are so wonderful this time of year. I can't wait to try this recipe.